In the absence of a photo of Los Atomicos del Caribe, in the 1960’s, here is a long remembered group, Los Shadows. This band became the very first all-electric band on the island displacing the accordion, acoustic guitars and banjo. It had its first full set of drums, and guess who was behind the skins and sticks? Look at them carefully. On the drums, Nando Trejo, a young teacher at the R.C.School. Behind the bass, Angel Nuñez, another young teacher. Behind the lead guitar was Wil Nuñez, who was the most experienced musician and band leader too. Behind the accompaniment guitar was Wilber Marin, a young fisherman. And who can forget the golden voice of San Pedro, the grand romantic vocalist Oscar Aguilar. Landy Guerrero tagged with the Shadows to play this percussion instrument known as guiro or Rascador in San Pedro. 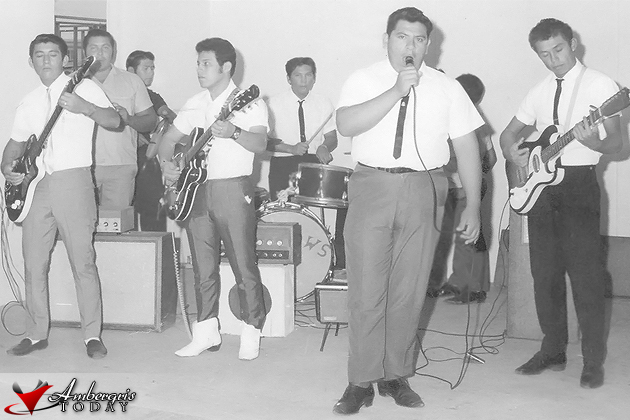 Los Shadows commenced in 1970 played at weddings, quinceaños, parties, Christmas and all about and became the first group to play at functions in Belize City beside big bands like Glenn Bood and the Telegrams. Wonder why they were in necktie in this flashback? It was their first wedding of Lalo Tolosa and Ermelinda Aguilar held at the village community center, now Town Hall. Break Away into Paradise with the New Wholesaler Agency in Belize!